With a limited number of premium protein and carbohydrate sources, these nutritious all natural dog treats make an excellent addition to a limited ingredient diet. 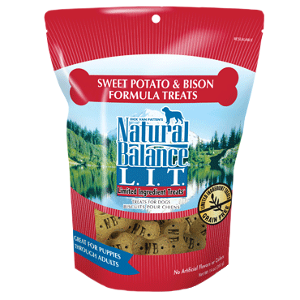 These anytime treats are also designed to support your dog’s digestive health, and they have a delicious taste and crunchy texture that dogs love! Dried Potatoes, Sweet Potatoes, Bison, Potato Protein, Dried Cane Molasses, Canola Oil, Natural Flavor, Salt, Natural Hickory Smoke Flavor, Natural Mixed Tocopherols, Citric Acid.